Learn how to fix "We can't sign you with this credential because your domain isn't available" error in Windows 10, in this post. Earlier, we have seen how to fix ‘We can’t sign into your account‘ message after login in Windows 10, in this guide. Today, in this article, we’re going to discuss yet another similar issue which may be faced by domain users. This problem may sometimes also termed as “We can’t sign you with this credential because the network isn’t available“. If you’re the administrator for the network and your users are facing this problem, you must advise them to leave and then reconnect to the domain. You can also suggest them to login with no connectivity, to check if they could login locally. If they still have the problem, here is how to fix. 1. First of all make sure that DNS settings are correctly configured on client machine. The DNS should point to Domain Controller (DC) or Internet Service Provider (ISP). 2. Try removing protect users group. 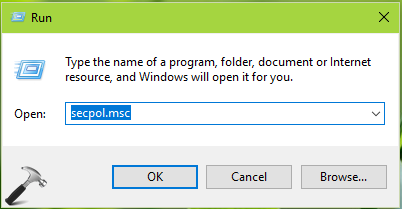 Press + R and put lusrmgr.msc in Run dialog box and click OK. In lusrmgr snap-in, click Users > Protected User > right-click and choose Delete. 3. Try creating new user profile and see if that allows the user to login. This problem can by easily fixed by turning off local caching of logon information. 1. Press + R and put secpol.msc in Run dialog box. Click OK to open Security Policy snap-in. 3. In the right pane of Security Options , look for the Policy setting named Interactive logon: Number of previous logons to cache (in case domain controller is not available). Double click on it to modify its value. 4. Finally, set the value to 0, which means Do not cache logons. Click Apply followed by OK. Close the security policy snap-in. Reboot and this should fix up the problem. How do you do all things when I cant even log into the computer ? ?